A sketch of the final scene in “The Other Gods,” commissioned by Brian O’Connell! I was torn as to whether to draw Barzai’s transfiguration at a distance, to show the scale, or up close, but in the end I chose ‘up close.’ Brian specifically asked me to draw certain of the Lovecraftian Other Gods (can you guess which ones?) in the picture. I break with Cthulhu Mythos canon in that I don’t really think of the Dreamlands and the non-Dreamlands stories as being in the same ‘universe’; Nyarlathotep and Azathoth are definitely there in Dreamland, and all the other shadowy half-hinted horrors of the cosmos, but I have trouble imagining the purely materialistic creatures from Lovecraft’s later works, say the Mi-Go, the Great Race, etc., existing in a universe where great dreamers can craft reality and where the gods really *do* care about humans, even if only in the sense of intentionally smiting them (and inviting them to Hadath to give them lectures). Of course, the work of creating a roleplaying game setting or doing a complete categorization is really trying to make it all fit together somehow…. but I’m happy with Lovecraft’s fantasy phase not quite meshing with his later science-fiction phase. Regardless, in this drawing late-phase and early-phase Lovecraftian horrors coexist to crush the hopes of the poor Dreamlanders. MERCIFUL GODS OF EARTH!!!! AGGGGHHHH!!! Since The Other Gods are not given any descriptions, one could do what one thinks would look otherworldly. Though I would expect them to perhaps not be as wild as the other entities. Still a great illustration and I can only imagine it in color———WOW. But are the Dreamlands some other dimension? I get the idea that some of them originated in our world in a prehistoric historical time not yet legitimated by historians, the rest is alien to us. We are also told that the zoogs have two places that connect with our own dimension. Which also bespeaks of more than simply dreams. Unless they are dreams made real as Robert Heinlein spoke about where the fictons under human unconscious manipulations form into a real universe, or pocket dimension. The really strong ones are stable and long lasting like Oz an Wonderland. [sigh] Even more amazing on the website. I agree with Night-Gaunt49 here: may I have permission to colorize it a little? Not on the actual drawing, but on a print-out or something? As for the Dreamlands being in a separate universe, yes, I agree. I still haven’t seen that film version but I heard about it. HP Podcraft mentioned it awhile ago… the stills look awesome… I’ll watch it tonight if I can find the time!! 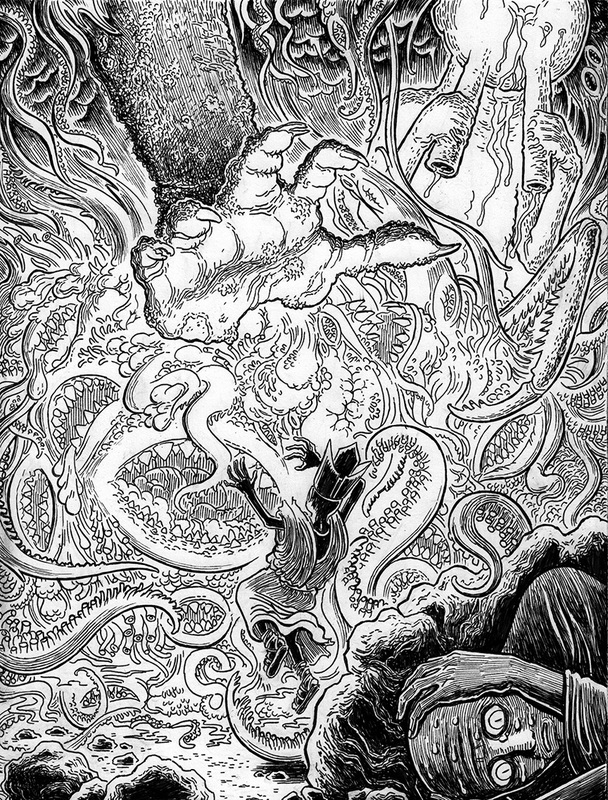 It is interesting to me how different artists interpret Lovecraft’s creatures including myself. However since I discovered his own drawings of a ghoul and of the Cthulhu I have modified the latter by giving it six eyes, three on each side in the pattern of a triangle tightly packed. My version of the ghoul was very close too. Now ghouls are depicted in many cultures from Japan to Tibet to India and the Middle East, the “gul” who live in the wilds and feed on the recently inhumed. But none of them look like the ghouls that Lovecraft described. I like how he made at least some of them changelings. That they start out looking human but over a period of time metamorphose into ghouls. Though it seems that those humans who are taken can also change being in close proximity to the ghouls themselves. They seem long lived too. I must say I do like the new CW sereis “iZombie” I like how they handle it. Where did they mention the movie on H.P. Podcraft? I have to tell him!